NOTE ... In England before 1752, the first day of the year was 25th March, not 1st January. So Newcomen, who was born on 24th February, was born in 1663 Old Style and 1664 New Style. This is usually written 1663/4. Thomas Newcomen's hands-on involvement with the installation of the engines he invented most likely finished in about 1720, on completion of the Wheal Fortune engine in Cornwall. What was he doing for the remaining nine years of his life? While we know few details, it seems he still took an active interest in engineering. He also spent time visiting London. His son Elias accompanied him in the capital on at least one occasion. On 7th May 1725, he wrote from Dartmouth in Devon to Chief Justice Peter King (1669-1734, later Lord Chancellor) about a "new invented wind engine". It had been patented in Holland (the Netherlands) on 24th January by John Calley (died 1725/6), son of his late business partner of the same name, and John Brent. Brent had taken out an English patent (No. 471) for a windmill with horizontal vanes on 26th October 1724. In 1727, Newcomen spent Christmas in London, staying with his friend and fellow Baptist Edward Wallin (c.1679-1733), who was of Swedish descent. The Wallin household was in the parish of St Mary Magdalen, Bermondsey, and it was here that he wrote the only letter to his wife Hannah that survives. It is dated 30th December and refers to her own letter of four days earlier (see letter to Hannah). The following year, problems resurfaced concerning loan repayments made in 1718 to Sarah Dottin. Hannah usually dealt with the finances while he was away, and in 1718 she had paid Mrs Dottin several sums against a £40 debt, which she noted in a ledger. However, Mrs Dottin had not provided receipts, perhaps owing to illness as she died sometime around January 1718/9. Her brothers Arthur Prideaux (1675-1728) and Walter Prideaux (1676-1759) were her executors. Newcomen had returned to Dartmouth in August 1719, expecting to clear the various debts. The Prideaux siblings would not allow him to clear the £40 one on the grounds that there were no records of the 1718 transactions and Newcomen had no receipts. By this time, Newcomen had gained recognition for his engines and his success may have led the brothers to believe that they could benefit from the situation. However, Newcomen did repay them monies for which there were receipts — a total of £169 7s 6d (around £22,000 in today's money) including interest. The dispute dragged on, and in 1727 Walter Prideaux, acting with his cousin Walter Jago (1669-1733), started a court action and "procured Newcomen to be arrested and held to special bail and threaten to proceed to get judgement and execution against him for the whole sum" — the £40 plus the interest accrued over the intervening years. Newcomen was plaintiff in the case at the court of Chancery (reference C 11/494/14) in 1728. The case concluded in 1729. The court's decision is not known. 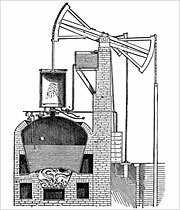 On 29th January 1728/9, visited Harrison & Waylett's foundry at Windmill Hill (now Leonard Street) in Clerkenwell, London. Apparently he was enquiring about the casting of cylinders for steam engines — so it seems his enthusiasm for engineering matters was undiminished. Whether he stayed in London for most of that year or returned to Dartmouth is not known. However, it was at his friend Edward Wallin's house in London on 5th August that he died, reportedly of a fever. He was 65 years and 5 months old. His nephew John, son of his elder brother John, the apothecary, was present and conveyed the news to Newcomen's son Thomas in a letter written the same day. Thomas Newcomen was buried three days later in the non-conformist cemetery at Bunhill Fields on City Road, London. The exact grave site is unknown. He had died in a Baptist household. Between 1702-33, Wallin was the pastor of Maze Pond Baptists in Southwark, London. Back in Devon, following his death, the Dartmouth Baptists would have no minister for 56 years and their numbers dwindled — only nine would remain in the group by 1798. Of his documents, both personal and business, almost no trace remains. Only two of his letters survive but that should not imply that he did not keep records of his transactions. In a time of widespread illiteracy in England (around 50% for men and about 80% for women), both he and Hannah read and wrote fluently. However, he did't leave a will, and probably left little in the way of money. He had no patent solely in his name for the steam engine, and the revenue he derived from the Savery patent was not commensurate with the value that his machines delivered to their owners. His three children — Elias, Thomas and Hannah — would all marry after his death. Aged 32 years, Hannah married William Wolcot of Clifton, Dartmouth, on 28th December 1742 at St Saviour's church. Wolcot was a surgeon, uncle of the doctor and satirist John Wolcot (1738-1819) who wrote under the pen name Peter Pindar. He apparently educated Pindar, and Pindar is said to have painted Newcomen's portrait in oils (perhaps from an earlier image, as he was born after Newcomen's death) but the painting is lost. Hannah and William had no children. In 1749 Elias married Hannah Waymouth (b.1730), a cousin or relative of his mother, and daughter of Samuel Waymouth, a tobacconist of North Street, Exeter. Elias was 43 years old and his bride was 19. They lived in Dartmouth and had five surviving children: Martha, Samuel, John, Hannah and Thomas. Samuel and John moved to America and died there. Thomas married, though his wife's name is not known, and lived in Taunton. The couple had four children: Thomas, Hannah, Martha and William. Newcomen's wife Hannah died in 1756, aged 74, surviving her husband by 27 years.